MPEG is working on a new coding standard called Versatile Video Coding (VVC). A colleague recently sent me a presentation from Thierry Fautier, VP Video Strategy at Harmonic, which contained some preliminary encoding results to be formally presented at a paper given at IBC. The presentation was from a short talk Thierry gave at the Mile High Video 2018 conference. 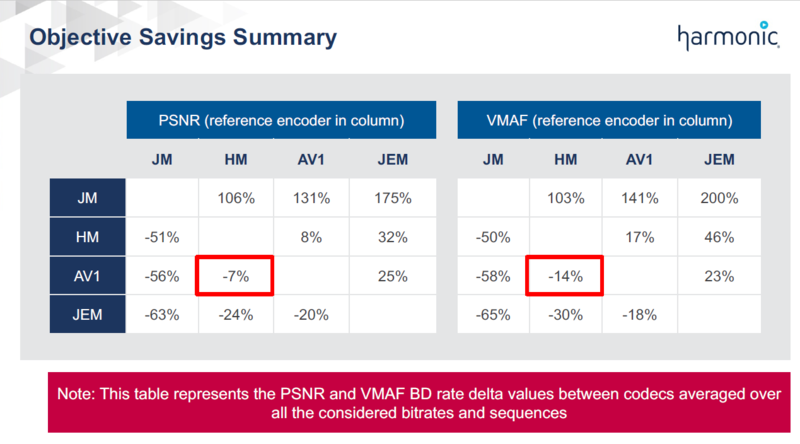 The presentation states that VVC should be ready for release in 2020 and is designed to deliver “a bitrate reduction of at least 50% that of HEVC.” Together with a company called b<>com Harmonic produced a codec study comparing H.264, HEVC, VP9, AV1, and VVC. The following slide shows the results, with JEM=VVC, HM=HEVC, and JM=H.264. PSNR comparisons are on the left, VMAF on the right. These show VVC, AV1, and HEVC at the top, neck and neck, with H264 trailing badly. Another way to analyze these results is via the BD-rate values as shown in the slide below. These numbers represent that data rate savings (or costs) you would achieve by using one codec over another. 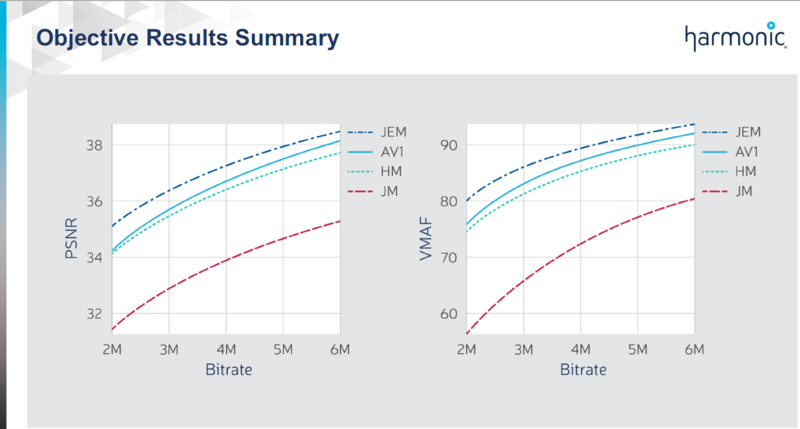 Highlighted are the HM (HEVC)/AV1 comparisons which show that AV1 delivers the same PSNR quality as HEVC with a 7% data rate reduction and the same VMAF quality with a 14% reduction. On the following slide, however, Theirry shows subjective results that favor HEVC and VVC over AV1, though the slides show little detail about the tests. Subsequent slides detail AV1’s glacial encode times, which are perhaps ten times longer than VVC, though VVC’s decode requirements are around 3x that of AV1. Other details covered in the comparison (browser compatibility, licensing) are all pretty well known (see slide at the top). The penultimate slide contains the following blurb about VVC and is perhaps the most interesting slide in the deck. From my perspective, irrespective of VVC’s performance, it makes no sense for MPEG to launch another codec without addressing what Theirry called HEVC syndrom(e). Without question, HEVC’s success has been hampered by the royalty land grab that’s still unresolved today, over five and a half years after the codec launch (see here for an overview). Regarding the quality comparisons, I’ll withhold judgment until I see the encoding details from Thierry’s IBC paper. Certainly, these results differ from what others have published, like Facebook, bitmovin, and Moscow State University. I’m in the process of running my own comparison tests of AV1, HEVC, VP9, and H264, which will publish on the Streaming Media site in about two weeks. By the end of September, we should all know a whole lot more about AV1 quality.